Paul Krugman and Megan McArdle agree: the housing bubble wasn’t caused by either predatory lending or the evil CRA. How do they know? Because if either of those were the explanation, then only residential housing would have been affected. 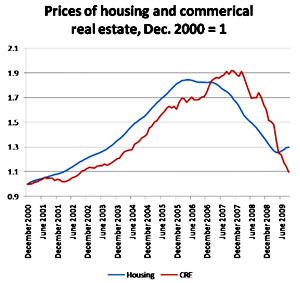 But in fact, commercial real estate went through essentially the same boom/bust cycle,as shown in the chart on the right. I think that’s basically right. There was plenty of predatory lending, but I suspect that causation goes in the other direction: the bubble provided more opportunity for predatory lending, not the other way around. And the right-wing theory about the Carter-era Community Reinvestment Act being responsible for the bubble has never been anything other than crazy. There’s just no evidence for it at all. The one thing that does tie together both the residential and commercial bubbles, however, is leverage. In both cases, prices were propped up by vastly increased use of debt and leverage at all levels. Home buyers were allowed to take out mortgages with tiny (or no) down payments. Loan-to-value ratios (the rough equivalent in the CRE world) took off. The resulting mortgages were securitized and sold off so they wouldn’t count against bank capital requirements. Those in turn were transformed into derivatives with lots of additional baked-in leverage. The derivatives were then insured via credit default swaps to essentially remove them from bank balance sheets. And all along the way, both the SEC and international regulators obligingly reduced bank capital requirements. Put together, all of this allowed effective leverage ratios at big banks and hedge funds to soar and debt levels among consumers to reach record heights. All of that affected the pool of money that drove both the residential and commercial real estate booms in multiple countries. It’s not the only explanation for the bubble (fraud and predatory lending helped feed the fire, as did Ben Bernanke’s “savings glut” and the insane belief in the ability of derivatives to hedge away all risk), but it’s at the core. It was at the core of this bubble, just as it was at the core of the collapse of Long Term Capital Management, the Asian crisis of 1998, the Nordic bubble of the early 90s, the Japanese bubble of the late 80s, and, if you want to back further still, the stock market crash of 1929. If you want to control asset bubbles, you have to control leverage. Not eliminate it, but control it. The fact that neither U.S. nor European regulators have seriously taken this on over the past year is a very discouraging sign that all we’re doing with regulatory reform is tinkering around the edges. If we don’t get serious about leverage, 2008 is going to happen all over again in another decade.